Upper dolpo mugu trek is a network of existing treks and trails which together form one of the longest and highest walking trails in the world. It is a proposed trail up to 6200 km stretching the length of the Greater Himalaya range from Nanga Parbat in Jammu and Kashmir to Namche Barwa in Tibet. Thus, passing through Kashmir, India, Nepal, Bhutan and Tibet. It is the longest and highest alpine walking track in the world. Apparently, only the Nepal and Bhutan is recorded to have been walked through. Nepal’s GHT has 10 sections comprising a network of upper and lower routes. Upper dolpo mugu trek is a major attraction for tourists, but popular destinations have been limited to the regions of Solukhumbu, Everest, Annapurna and Langtang. The Great Himalayan Trail creates a trekking route that crosses both well-known areas as well as other lesser-known sites (relatively poor but with enormous tourism potential). The Trail also links together a range of the less explored tourism destinations and products of Nepal’s mountain region with a vision to create an iconic tourism experience among the visitors from across the world. 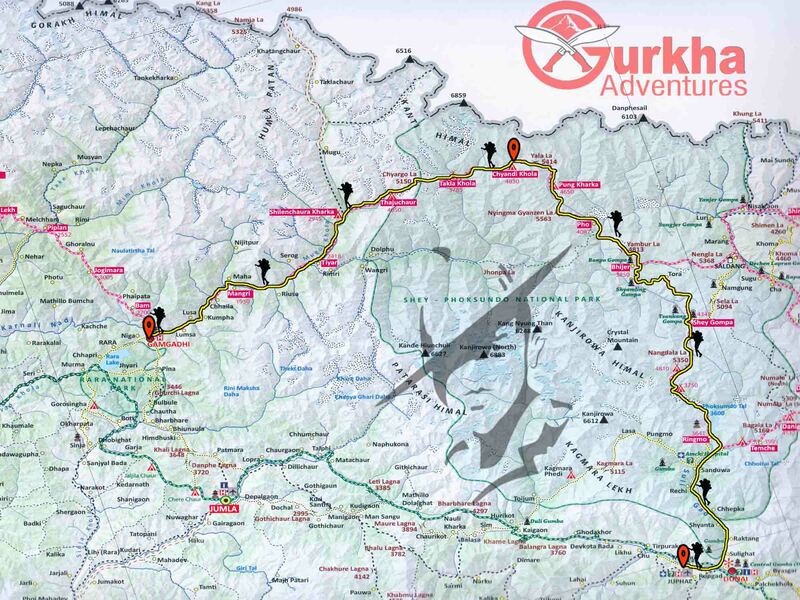 The purpose of developing the trail was also to promote socio economic benefits to mountain communities as it passes through 16 districts of Nepal, ranging from Dolpa that connects with the Tibetan plateau to Darchula, which also borders India. The route offers an incredible diversity in terms of landscape, flora, fauna, people and culture. Winding beneath the world’s highest peaks and visiting some of the most remote communities on earth, it passes through lush green valleys, arid high plateaus and incredible landscapes. Nepal’s GHT has 10 sections comprising a network of upper and lower routes each offering something different, be it adventure, exploration, an authentic cultural experience, or simply spectacular Himalayan nature.